According to Kristy Allen, who works as a Minneapolis beekeeper, she has built up a business doing the exact thing she loves the most: caring for honey bees. Allen maintains her hives, sells her bees’ honey, and works as a beekeeping instructor—all while adhering to environmentally sustainable beekeeping practices. She’s seen so much success that her business, which she aptly named The Beez Kneez, brings in a yearly revenue of around $200,000. “When I started in 2010, we just didn’t anticipate that kind of growth, and it’s not waning,” says Allen. However, Allen is most pleased about a device of her own invention: the Beez Kneez Honey Cycle. For many beekeepers, they use hand-cranks for extracting honey from a hive, which “looks kind of like a butter churner that sits on the side of the machine,” per Allen. “It’s really awkward to use.” Allen decided several years back that there had to be a simpler extraction method. 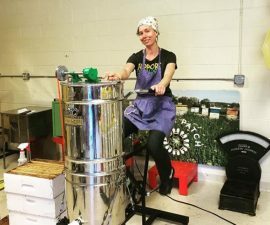 As a devoted biker, Allen initially started her business as a honey bike-delivery service—dressing up like a honey bee, biking around Minneapolis, and dropping honey deliveries off for food co-ops, restaurants, and similar clients. So, she headed to her regular bike mechanic to tell him of the difficulty of extracting by hand. Per Allen, “I said, ‘Help me make this pedal powered.’ And so, I literally gave him a six-pack of beer, and we sat in his garage and just noodled around like, ‘How can this be the best for the beekeeper?’” Together, they planned to make something that looked like an exercise bike with a big tank attached to it. With a modest grant specifically geared toward environmental initiatives as well as some funds from a Kickstarter campaign, they built a basic device out of bike parts, which Allen said was “not super functional.” However, they got attention almost immediately. “After our Kickstarter, I got a lot of emails and requests from around the world, ‘I want the design. Can I buy this thing? Can you tell me how to build it?’” Allen said, and she was later contacted by a civil engineer to help. Eventually, with the engineer’s and many others’ help, Allen designed something special and started taking orders. Now, the Honey Cycle’s most recent update is used to extract and filter honey. 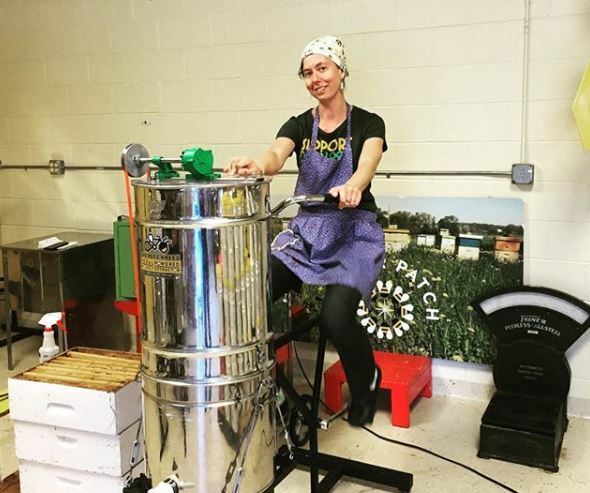 At the Beez Kneez’s Minneapolis location, customers can pay hourly and use their own legs for extracting honey, which is far less exhausting than hand-extraction. “Kids and adults can both do it, and hobby beekeepers, like a grandpa. Of all the things that make us stick out, [it’s] what I’m most proud of,” Allen said.